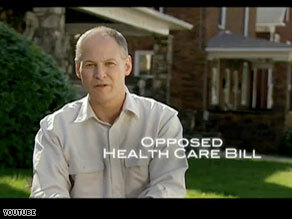 Democrat Mark Critz says in a new ad that he never supported health care reform. Washington (CNN) - The Pennsylvania Democrat running for the House seat formerly held by the late John Murtha released an ad Saturday that refutes Republican charges that he supported health care reform. The National Republican Congressional Committee went on TV earlier this week with an ad painting Mark Critz as too liberal for Pennsylvania because of his support for federal health care legislation. "Mark Critz, he'll put the liberal agenda before Pennsylvania," the ad said. But in his own thirty-second spot released Saturday, Critz denies he was ever a supporter of health care reform. "That ad is not true. I opposed the health care bill, and I'm pro-life and pro-gun. That's not liberal," Critz says in the ad. Critz is set to face Republican Tim Burns in a special election on May 18, and enjoys a political protection that incumbent Democrats running in 2010 won't have – he never cast a vote in Congress for or against health care reform. Though a GOP win in the district would be the first in many years, it would not be a complete surprise. Murtha, who steered millions of federal dollars back to his home district, rarely had any serious challenges in his 18 re-election contests. But the district, which stretches from Cambria County in west-central Pennsylvania down to the southwestern corner of the state, is a conservative-leaning one. In the 2004 presidential election, Sen. John Kerry won Pennsylvania's 12th Congressional District by 2 points. But Sen. John McCain narrowly edged out Barack Obama in the district in 2008, even though Obama carried the state by 10 percent. "That ad is not true. I opposed the health care bill, and I'm pro-life and pro-gun"
Okay Okay I believe you. Just one question. Why are you taking up space in our party?